As the calendar year changes, so do trends in motorcycling – this is a story that dates back to the earliest productions of the Indian in 1901 or Harley Davidson in 1903. 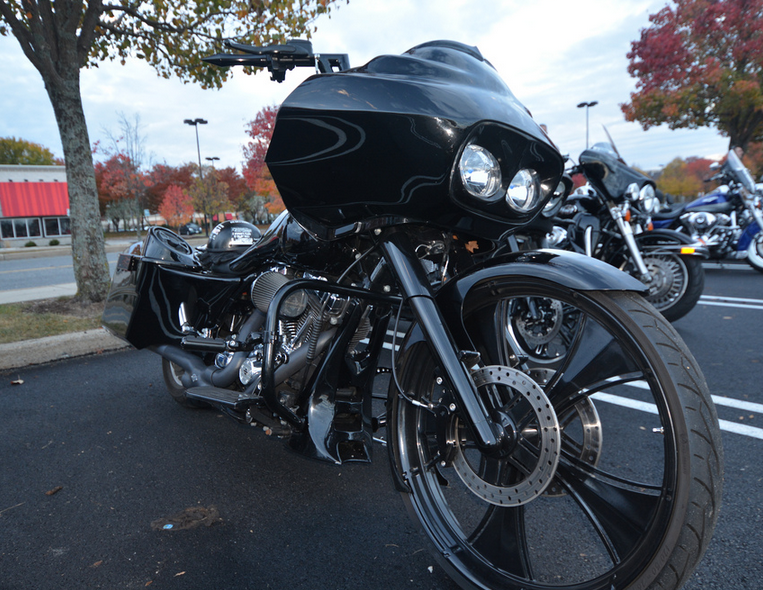 2014 is the year of the ride-able bagger. Not only do trends come and go but similar patterns of evolution occur from one bike style to the next. The phases are standard and people’s tastes morph as the trends become more unattainable and less practical. Baggers have been around for decades but it wasn’t until 2004 and 2005 that they became the target of ultra-customization similar to their chopper predecessor. Over the next few years the rakes were increased, bags lowered, fairings molded and wheels grown. As recently as 2010 a bike builder could enter a bagger and potentially win a show with little more than some custom paint, aftermarket floorboards and chrome wheels. 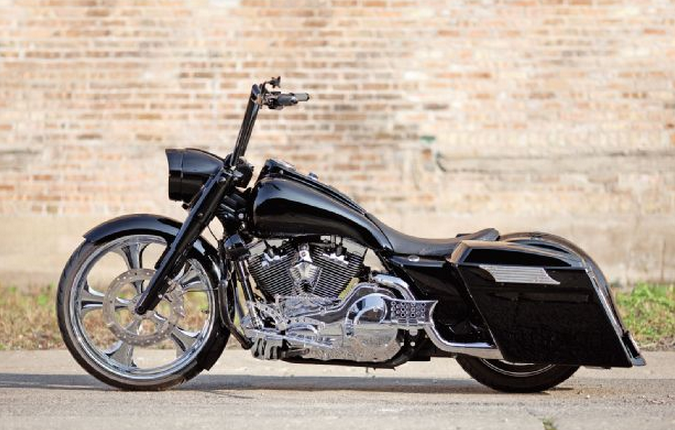 See the Bike “Thug Life from Baggers Mag January 2010 edition below). http://bit.ly/19NQ7LF – At the time we loved this bike (and still do). It was cutting edge in 2010 with a 23″ wheel and stretched bags but looks almost stock by today’s standards. Today, 8” stretched bags, a 30” wheel, 18” bars, etched metal accents all precariously suspended by air shocks will hardly qualify you for the most amateur of shows. Fairings are customized requiring hours of bodywork – often blocking much of the light meant to be cast out by halogen beams. Chin spoilers practically drag the ground clearing a path to a frame to be eaten by the shallowest of potholes. And cornering is now defined as a mistake resulting knocking out the inside corner of your saddlebag when you attempt a slow-speed turn. Many trophy winners are no longer motorcycles – with some exceptions they are pageant contestants. Think back to the most recent trend of chopper customization (The 1990s – not the other chopper trends over time). Originally bikes were cleaned up with some aftermarket directional, less wiring and new drag bars. Eventually dropping the 130 rear tire for the 150 was not enough and swing-arms were replaced to allow 240 and 300 tires on the back complimented by a 21” + on the front. The rakes became more aggressive and some choppers stretched to 10 Feet. These bikes proved to be totally impractical and many riders looked for a more utilitarian entrée to feed their riding need. Check out eBay for choppers and you’ll see that once $50,000 masterpieces garner little demand at a $8,000 price tag. Thus, the bagger trend was born. We are experiencing a similar metamorphosis today with baggers becoming unwieldy and many riders (as well as builders) opting to pick ride-able over show-able. At Beantown Baggers we have seen this trend in the comments of the bikes we have posted though the past few months. As our fan base grows, the need to balance the bikes people want to show with the bikes readers actually aspire to ride takes on an increased priority. Readers recognize and respect the work that goes into show baggers but with greater frequency have begun to question the pragmatism of the machines. 2014 will mark the last year of the over-the-top bagger. Builders will retreat to smaller wheels, manageable bars, speaker lids that don’t leak and more sensible frames. This does not mean for one minute that baggers will disappear – quite the contrary as the bagger is the only bike boasting both a utilitarian existence and a canvas big enough to showcase creative genius. In the future, buyers will encourage builders to construct beautiful bikes coupled with music, ample storage and creature comforts that can not only be ridden comfortably but aggressively for tens of thousands of miles each year without sacrificing any style or originality! This is the point where we highlight a very highly customized bagger from the White Knuckle 300 ride last November that the owner was still able to whip around corners at neck-breaking speeds (see below). The point is that fashion and function don’t have to be at odds with one another. What do you think? Are we smoking crack? Are wheels going to get even bigger? Rakes larger? Bikes more stretched? Tell us what you think and we’ll happily write an apology in the coming years if this prediction is wrong. I’ve been riding a road glide for the past 8 years and although I love customization you still can not beat the ride and handling of a stock bike! Thanks for the comment and agreed that there is something to say about the way HD tests their stock bikes. With this said, their stock suspension leaves a lot to be desired and simple changes like pipes and breathers can add a lot of bang for the buck. The pageant winners are purrty, but they’re not ride-able! I think you guys are right- 2014 will be the year of “form & function”. There will be bikes that ride as good as they look. No more saddlebag draggin’ or freakish wheels & tires! When I see a bagger like that all I see is someone showing off their bankroll- not my cup of tea! I love motorcycles, but I’m a working man on a budget. I hope 2014 will be the year of ride-able and practical machines! I never bought into “the difference between men & boys is the price of their toys-” A real man (or woman) spends within reason. When you have kids you have expenses. I do what I can to personalize/customize my bike, but spend the house for braggin’ rights on amateur night? Not me!